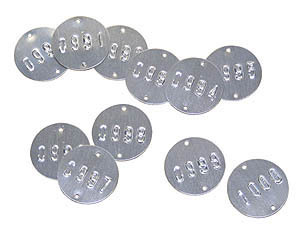 25mm round tag with embossed numerals and two holes. Available from 0001 to 9999. Supplied in sets of consecutively numbered tags. Nails available in packs of 200 and 2000. Most available from stock - please call +44(0)1904 692723 for more details. The ideal nail for attaching Tree Tags.